Atchison Topeka improved the efficiency of its UK operations by consolidating multiple food distribution centres into a single facility that transfers powdered food ingredients from bulk bags into bulk tanker trucks. The plant’s new closed-loop bulk transfer system consists of a bulk bag discharger integrated with pneumatic conveying equipment that blows bulk material into the trucks, while recirculating displaced air and recovering dust from the airstream. To meet food industry standards, the process was required to comply with BRC (British Retail Consortium) requirements in three areas: bulk tankers, warehousing and palletized distribution. While the facility would be handling a variety of food ingredients, analysis showed that most exhibited bulk densities of approximately 650kg/m3. Most were also free-flowing or semi-free flowing, with an angle of repose of 40° to 60°. One of the ingredients, however, was relatively hygroscopic and prone to bridging, so the equipment needed to prevent cavitation. At the heart of the bulk transfer system (manufactured by Flexicon) is a BULK-OUTTM Model BFC bulk bag discharger configured with a cantilevered I-beam, electric hoist and trolley, flow promotion devices and a hopper equipped with a rotary airlock valve. The dilute phase pneumatic conveying portion of the system consists of a positive displacement pressure blower, pneumatic conveying line and a filter receiver located downstream from the bulk tanker truck. Automated controls orchestrate operation of the flow promotion devices, rotary airlock valves, blower and filter receiver. All material contact surfaces throughout the system are of 304 stainless steel finished to food standards. To start the process, a forklift or pallet jack is used to place a bulk bag in front of the discharge frame, where an operator attaches four bag loops to clips on the unit’s bag lifting frame and, using a pendant, activates the hoist to raise the bag, and the trolley to move it into the frame, and after which it is lowered onto the spout connection point. A Spout-LockTM clamp ring, which is mounted atop a Tele- TubeTM telescoping tube, securely connects the clean side of the bag spout to the clean side of the equipment, after which the telescoping tube exerts continuous downward tension on the bagspout. Theoperatorthenreleasesthebagspout’s drawstring, allowing material to fall freely into the hopper with no dusting. Flow FlexerTM plates raise opposite bottom edges of the bag into a steep ‘V’ shape, loosening compacted material, while constant downward tension exerted by the telescoping tube as the bag empties/elongates promotes complete discharge from the bag. Material in the hopper is fed through a rotary airlock valve and pneumatic pick-up adapter into a pneumatic line that runs horizontally for 1m and at an incline before penetrating the exterior wall of the building to discharge material into a tanker trailer. The air stream provides sufficient force to blow the material the full length of the trailer’s interior. 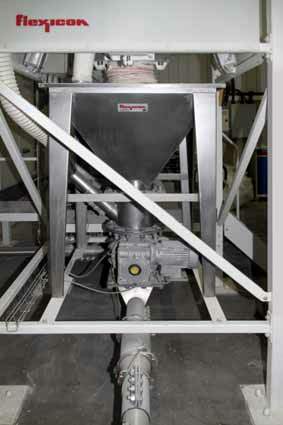 A return line vents displaced air and dust to the filter receiver that collects any carry-over material for later reintroduction to the pneumatic conveying system. The design of the bag-to-truck solution utilizes modular components that will allow the distributor to re- purpose its process for other applications, such as transferring powders from trailers to bulk bags, or new materials with varied handling characteristics. Along with consolidating operations, the dust-tight bulk bag discharger with totally enclosed pneumatic conveying prevented contamination of the product and plant environment, eliminated the need for a clean room, and simplified quality control procedures. The Droitwich facility builds on the distributor’s 20-year record for clean, safe handling of food materials and maintaining rigorous standards for public health and safety.